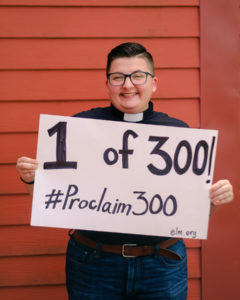 CHICAGO, IL: Proclaim, Extraordinary Lutheran Ministries’ (ELM) professional community for publicly identified gender and sexual minority ministers and candidates, has reached 300 members. 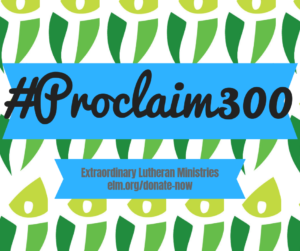 To celebrate, ELM has launched the #Proclaim300 campaign to raise support, awareness, and funds. Extraordinary Lutheran Ministries believes the public witness of gender and sexual minority ministers transforms the church and enriches the world. 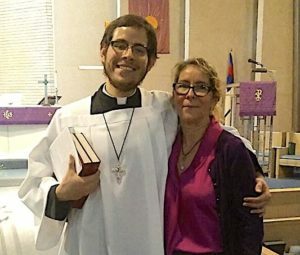 On September 20, 2018, Proclaim celebrated reaching 300 members when Sergio Rodriguez (he/him/his), a seminarian at Wartburg Theological Seminary, joined the community. ELM was founded in 2007 as a merger between Lutheran Lesbian and Gay Ministries (LLGM) and the Extraordinary Candidacy Project (ECP), which for years ordained LGBTQIA+ ministers “extraordinarily,” outside the bounds of the ELCA’s official doctrine, which did not allow it. In 2009, the Evangelical Lutheran Church in America changed their policy to allow gender and sexual minorities to serve the church as out and partnered ministers. Even still, congregations can refuse to consider ministry candidates because of their sexual orientation and gender identity, and LGBTQIA+ ministry candidates continue to face barriers and prejudice. To meet the needs of a growing Proclaim community – increased by 50% in the past 3 years – ELM’s #Proclaim300 campaign aims to raise 300 gifts of $300 by October 31, 2018 (Reformation Day), totalling $90,000. In addition to facilitating the Proclaim professional community, ELM’s Accompaniment program provides individualized guidance, mentorship, and resources for publicly identified Lutheran LGBTQIA+ ministers and candidates. ELM’s Ministry Engagement program advocates for these leaders by advising on church policy and equipping churchwide leadership, seminaries, congregations, allied nonprofits, and other organizations to employ and embrace Proclaim members. Follow #Proclaim300 on social media September 17-23, 2018 to see and hear stories about the gifts of LGBTQIA+ (lesbian, gay, bisexual, transgender, queer, intersex, asexual, plus) ministers through videos, images, personalized fundraisers, and testimonials. This entry was posted on Thursday, September 20th, 2018 at 2:16 pm	and is filed under Blog. You can follow any responses to this entry through the RSS 2.0 feed. Both comments and pings are currently closed.